He won three of the day's first four races and had narrowed the gap in the title race to trail rival Gordon Elliott by €226,714. Un De Sceaux, ridden by Mullins' son Patrick, provided the icing when making all to come home three and three-quarter lengths ahead of stablemate Douvan in the €275,000 Grade 1 Boylesports Champion Chase. "It's been a very good start to the week, so far so good," said an understated Mullins. 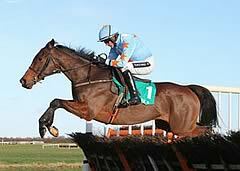 "I thought looking at Un De Sceaux that he was not really going in the first half of the race. He was on the wrong leg and not galloping out. Patrick said that he started to gallop at the first one down the back so decided to let him go on because at least he was moving well. "Paul (Townend on Douvan) thought he might have had enough in the tank to catch Un De Sceaux, but when he asked him to move he slightly disappointed. But Douvan showed he is no back number. Paul said he just didn't lengthen his stride as he thought he might. It was a hell of a performance from the winner, especially as he had been to Cheltenham and Fairyhouse. "I was disappointed with Douvan. I don't know why he did what he did. Maybe we minded him a bit too much after Cheltenham. We are always trying to mind him, but maybe I should have run him in Fairyhouse or given him a few extra gallops." Amateur rider Patrick Mullins added: "I have been dreaming about riding that horse, and since I was told I would be riding him, I have been like Charlie when he got the golden ticket in Willy Wonka. I schooled Un De Sceaux yesterday and even schooling him was some buzz, but it took him a mile to warm into the race. He did not jump or travel as well as he can and I was a little bit worried but I think that was down to the good ground. "Once he warmed up and started going, I just let him at it. He runs horses into the ground, doesn't he? Realistically, I did not think he was going to beat Douvan or maybe Min on this ground over this trip. He is a horse that always runs well though so you can never count him out."